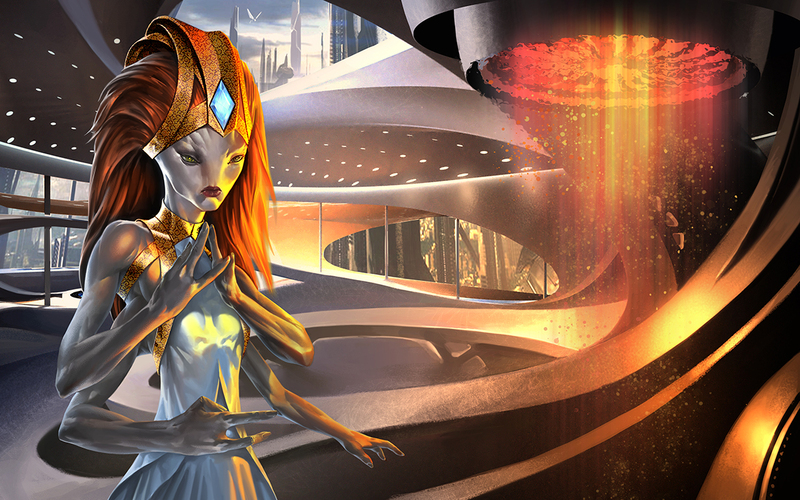 When you successfully invade and capture an alien colony, there is a chance that you will learn some of their technologies that are unknown to you. In fact, this is a great way to accomplish “research” by conquest! In particular, there is a 2% chance for each factory captured that you will plunder one of the victim’s technologies. This is now working in Java MOO, as evidenced below. With this, the code for invading colonies is basically complete. 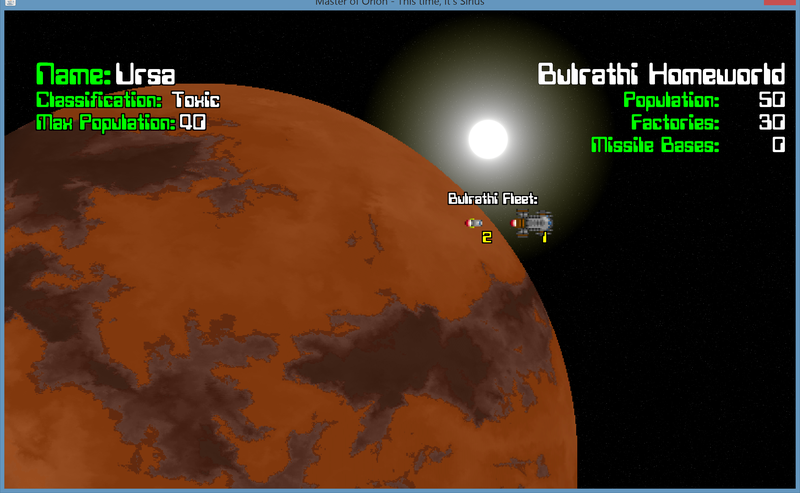 I’ll probably start working on the planetary bombing or sabotage features next. Anyone who has played MOO1 knows that the ground combat screen is entirely a visual frill. 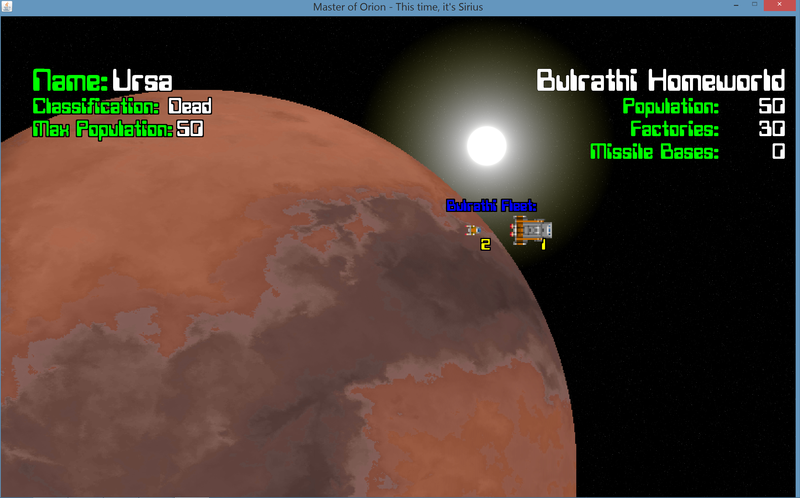 The player has no input into the combat once it has started and can only watch the outcome or skip to the end. However, immersion is important and this screen will be getting an graphic overhaul just like the rest of the game. 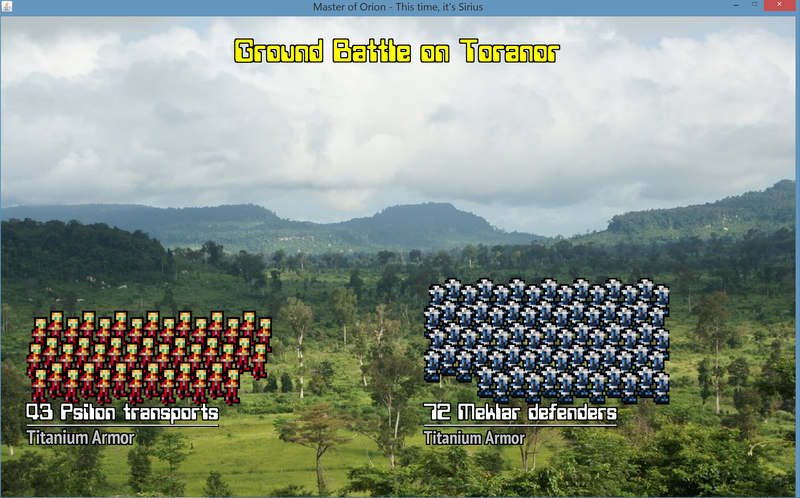 For now, I have implemented it with some placeholder graphics, including the extremely pixelated soldiers from the original game. Every image in the screenshot below will change. However, the programmatic work to implement the UI is complete now. All I will need to do is plug in the new graphics for the planet landscape, the colony ship and the soldier icons when they are completed. Please do not judge based on this screenshot, lol. 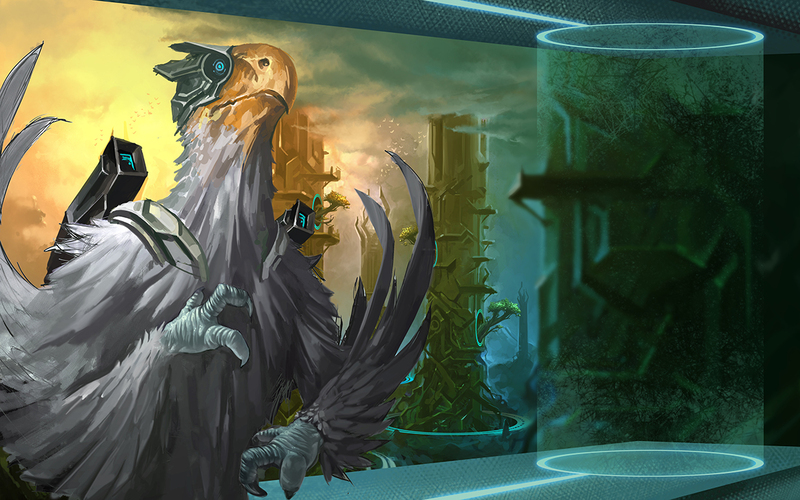 After millions of years of evolution, the Alkari are too large to maintain powered flight, but they still have amazing vision and can safely glide from arbitrarily high distances. Combine this aerial maneuverability with an advanced intelligence and shoulder-mounted weapons, and you suddenly have one hell of a fighting machine. In Soviet Russia, the bird shoots you. Note: this is unfinished, but close! Here’s how the coordination between the developer(me) and illustrator(Petar) goes… I have a broad idea of how I want something to look, so Petar gives me a rough sketch. I go “no, no, more like this” and then give him a link to some hastily-googled photo or image that kind of looks like what I had in mind. Then Petar responds by giving me something amazing and my jaw hits the floor. 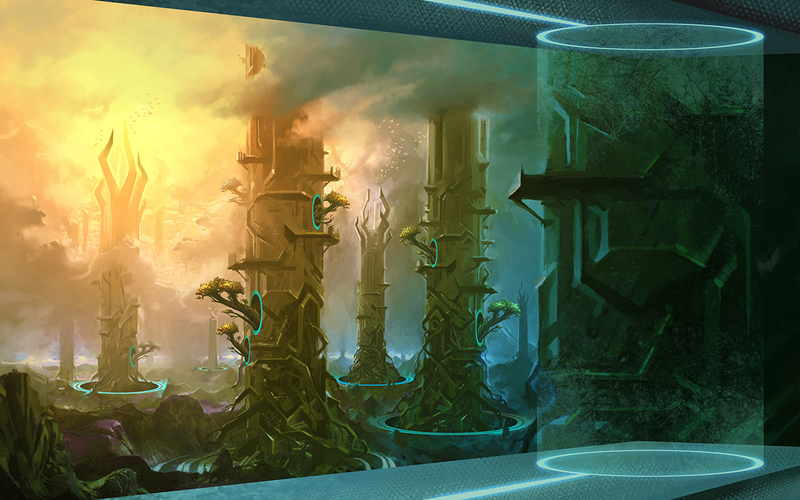 Below is a view of the Alkari homeworld from the open-air window of their laboratory. This is why, when you realize that you are working with someone very talented, you give them lots and lots of room to do their thing. There is considerable effort ongoing in this project to make each race feel unique and different. We are trying to artistically create unique worlds and shapes for each of the 10 races in addition to creating individualized backstories and over two hundred lines of dialogue. My job is just to connect all of the interesting pieces with code. Check it out and keep an eye on twitter @JavaMOO if you are particularly interested in this project, since commentary happens there as well. 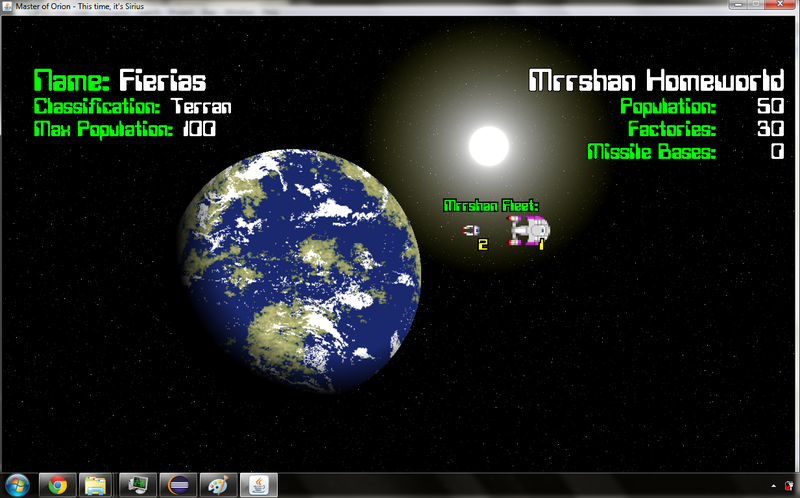 Below are a couple of screenshots to give an example of the recent changes to the planet generation code. Currently, the cloud layer is not being drawn as I am still working through some issues with integrating the NASA cloud maps into the new code. The color maps I am using will get tweaked a lot but I have a lot more depth to work with now. 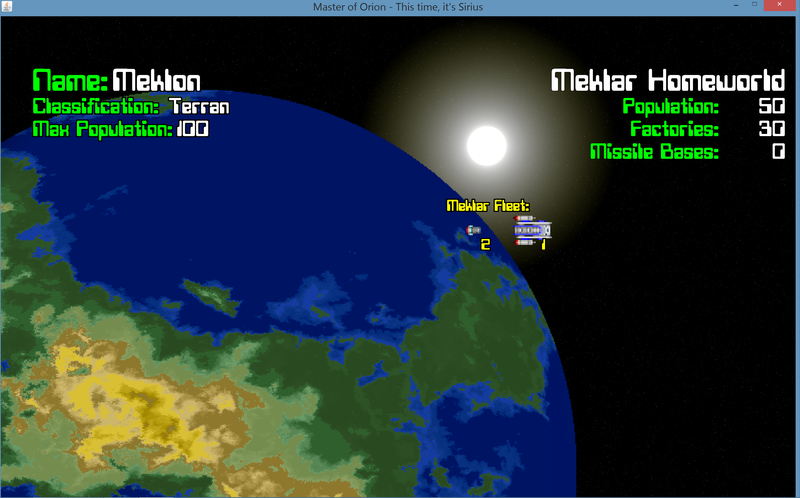 And because there are more pixels, the rotation of the planets no longer looks jerky. It’s been a while since the last post, so I thought I’d give a quick update. I’ve spent the past two weeks improving the animations to make them faster while dramatically decreasing the overall size of the game. In addition, I’ve completely rewritten the planet generation code to provide higher-resolution images of rotating planets needed for a few areas of the game. Currently, all that is left of that activity is getting the cloud layers to look better. The hi-res cloud maps from NASA are not hi-res enough, so I have to write an algorithm to intelligently upscale image to a higher resolution. Yes, literally a “zoom and enhance” feature. Petar, our illustrator, has been out sick for a week but should start having some Alkari illustrations in short order. Jeff, our writer, has finished the Silicoid backstory and their race-specific dialogue which I will be incorporating into the game tonight and tomorrow. 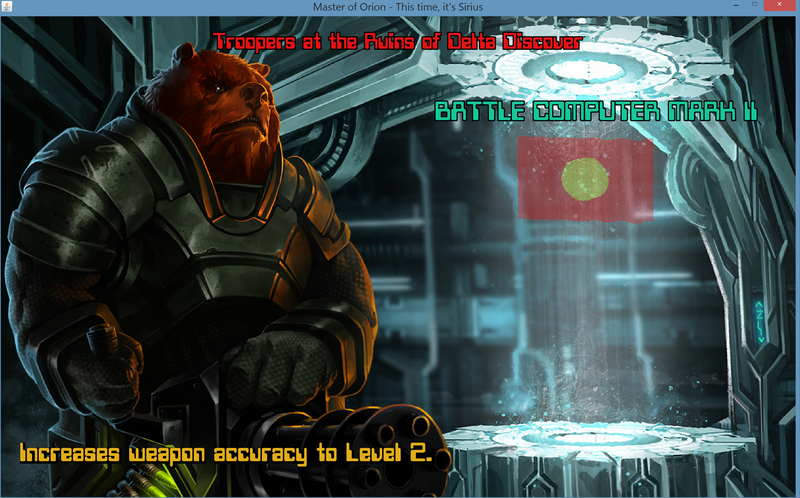 After that and the cloud images are done, I’ll continue work on the Phase 3 game functionality.